“Every so often you come across some article on Africa’s ‘blood minerals’ or the suicides at Foxconn,” says Nassos Katsamanis in reference to the Taiwanese contract manufacturer whose 1.2 million employees in China assemble consumer products for electronics giants such as Apple, Sony and Nokia. From his verdant balcony in the central Athens neighborhood of Mets you can see apartment buildings crawling up the slopes of Mount Hymettus. Scattered on the living room floor are his son’s wooden toys. Little Andreas has still not turned 2, but he can already tell rubbish from recycling. “It’s important to know that what you consume – the way you live your life at the end of the day – is not a burden on another man or the environment,” says the 34-year-old who works as a researcher on voice recognition technologies at the National Technical University of Athens. In his palm, he holds a Fairphone, the world’s first so-called “ethical” mobile device which was recently shipped to him from the Netherlands. Fairphone came about in response to growing criticism over the fact that mainstream electronics products, including those sleek cell phones, are produced using minerals which are mined in conflict-riven areas in Central Africa. When buying one of these products, consumers also help finance mass killings and rapes in the Democratic Republic of Congo (DRC). Meanwhile, these gadgets are assembled in factories with despicable working conditions and environmental standards. 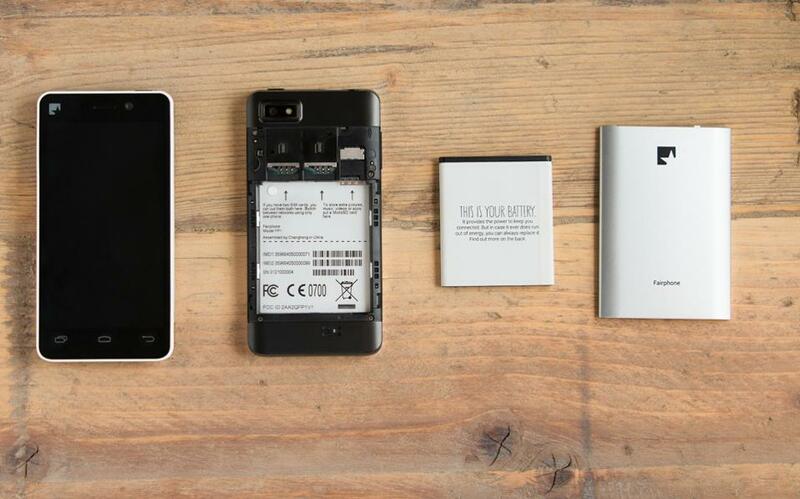 Fairphone, on the other hand, ensures consumers that the tin and tantalum used in its device are conflict-free. “As soon as I read about the project, I identified with it to some extent,” says Katsamanis, admitting that the effort is still in the early stages. Fairphone, which started out in 2010 as a public awareness campaign concerning conflict minerals in consumer electronics organized by three Dutch NGOs, evolved into a social enterprise three years later. Fairphone, which like most mainstream companies also manufactures its phone in China, has created a worker-controlled fund which aims at improving employees’ labor conditions and wage levels. For every device produced at the site, the company and the factory each invest 2.50 euros in the fund. Meanwhile, the company tries to be as transparent as possible by releasing a cost breakdown report of where every euro is spent and by regularly publishing social assessment reports on its factory. The Android-powered device has a micro-USB port (a charger is not provided with the phone; the idea is that there is at least one sitting in one of your drawers at home), dual SIM slots and a removable battery. The phone can be upgraded, repaired (heads-up: if you can’t fix it yourself, you will need to post it to the company’s service department in Holland), and, when the time comes, recycled by Fairphone after it has been shipped to the company free of charge. Everything has been designed with an eye on increasing the handset’s life cycle and reducing waste. It is estimated that about 140 million cell phones end up in rubbish dumps every year in the US alone. “I like the philosophy behind it. It’s like the old desktop computers which you could open up to switch the motherboard or add some extra memory,” Katsamanis says. From the company’s headquarters in Amsterdam, public engagement officer Daria Koreniushkina can’t hide her enthusiasm about the project. Following a successful crowdfunding campaign, the company has sold more than 55,000 handsets in a year and a half. However, “the phone is not the goal itself,” says the Russian, one of Fairphone’s 31 staff from 14 countries. “It’s more a storytelling device. It talks about the bigger picture, what goes inside the phone and the complicated production processes and the problems related to it. Legislation signed by the Obama administration in 2010 compels US companies to identify the sources of minerals in their components, while a traceability scheme has been introduced by the United Nations. Firms such as Apple and Samsung have taken some steps in a more sustainable direction, however they claim that certification of origin is not always feasible due to the large number of intermediaries in the production process. “We realize that we are very tiny at the moment and that alone we cannot bring about change. We would like other brands to join our mission and then we would have fulfilled our mission,” says Koreniushkina. Would that not make Fairphone, well, redundant? “We would like it if other companies started to produce their own ‘fair’ phone and then compete with them in terms of fairness rather than market share,” Koreniushkina says, adding that the production of a 100 percent fair phone is practically impossible because there are thousands of standards that could be improved. “Another issue is, what do you consider fair?” she says. The company fends off criticism that the Fairphone is a luxury choice aimed exclusive at well-off Western consumers. “One of the things we would like to prove is that ethical production is not necessarily more expensive. Our phone is not priced as a luxury product,” Koreniushkina says. At 325 euros, the Fairphone is no more expensive than other midrange smartphones. “Our target group is basically everyone, because nowadays almost everyone has a mobile phone,” she says, although the company stops short of prompting people to get rid of their working phones. Back in Athens, Katsamanis says that the stubborn economic crisis is not an obstacle to the success of the Fairphone. “I do not think things would be any different if people were better off. In fact the crisis could provoke people into thinking that the real cost is not the price of the phone. The point is to think in terms of cause and effect, in a broader context,” he says. If figures are any guide, few people think that way. Just 21 orders have been placed from Greece to date. “Ochi” (No) Day, when Greece refused to be annexed by a Mussolini-led Italy in 1940, is celebrated in the country as a national holiday, but most prefer to brush aside the fact that Ioannis Metaxas was a dictator. “Golden Dawn voters are drawn to power. A lot of them voted for the party because they wanted someone big and strong to stand up to the political status quo,” says Paschos Mandravelis, a liberal commentator. In September, a Golden Dawn member stabbed to death an anti-fascist rapper, Pavlos Fyssas, in a Piraeus neighborhood. The public outcry over his death prompted the government to arrest dozens of party members, including parliamentary deputies and Golden Dawn leader Nikos Michaloliakos. The charges include homicide, blackmail and running a criminal organization. Mandravelis believed that the crackdown would drive away a big chunk of the neo-Nazi party’s voters. “I expected that the sight of Golden Dawn members in handcuffs would remind people that there is a force larger than them, that these guys were not that untouchable after all, and as a result their popularity would be reined in,” he says. That has not happened. Nearly two months after the launch of a judicial investigation into the neo-Nazi party – which is reportedly linked to 10 murders, as well as attempted murder, blackmail, money laundering and other crimes – public surveys suggest that despite the aura of criminality around Golden Dawn, its popularity has not been hit. An ALCO poll conducted between November 12 and 15 for Sunday’s Proto Thema newspaper put Golden Dawn, which controls 18 seats in the 300-strong House, in third place with 8.8 percent, up from 6.6 in a previous poll carried out a month earlier. A Pulse survey for To Pontiki weekly between November 8 and 12 put the party even higher at 10.5 percent and clearly ahead of the once-dominant PASOK socialists, withering at 6.5 percent. A Metron Analysis poll for Ethnos on Sunday put support for Golden Dawn at 10 percent, more than 2 percentage points higher than a month earlier. Part of the reason behind Golden Dawn’s enduring appeal, experts say, lies with Greeks’ notorious lack of confidence in institutions. For more than a decade, public surveys have found Greeks to have among the lowest rates of trust in institutions when ranked with their European counterparts. This mistrust extends to the local media, which is usually owned by big business conglomerates considered to be compromised by their ties to political parties and whose stories are often seen as an extension of the status quo. “When the integrity of all social and political institutions is being questioned, faith in the media is also lost,” Mandravelis says. Some Greeks are so suspicious of the status quo, he says, that the crackdown simply confirmed already-held convictions and conspiracy theories. “The media are viewed with mistrust. All those people who think that everything is the result of a global conspiracy also believe that revelations about Golden Dawn are a part of this conspiracy,” he says. “Although the involvement of Golden Dawn in Fyssas’s assassination is likely to have weakened the party’s appeal among non-core supporters, Golden Dawn’s purported victimization has clearly boosted support among its core – i.e. young, male, anti-systemic voters,” says Elias Dinas, a UK-based expert on voter behavior. Whereas it was once considered taboo to endorse Golden Dawn publicly, over recent months a number of high-profile figures have been happy to admit their admiration for the extremist party. Vocalist Petros Gaitanos, famous for his performances of the Byzantine liturgy, pop singer Yiannis Ploutarchos or the idiosyncratic Notis Sfakianakis, have bashed the “corrupt” establishment and openly voiced their support for Golden Dawn. In a much-publicized outburst last week, singer Sfakianakis praised Greece’s 1967-74 military dictatorship, urged support for Golden Dawn and called Deputy Prime Minister Evangelos Venizelos a “pig.” Sfakianakis’s comments prompted pop diva Despina Vandi to announce that she would be breaking off her on-stage collaboration with him in Athens. These, and other similar comments, feed into the feeling of mistrust of the state and mainstream media, which is not unique to the right of the political spectrum. Critics from the left have accused the government of not actually being interested in bringing alleged criminals to justice, but rather intent on marginalizing an upstart that is siphoning voters away from the two coalition parties. In the June 2012 election, four out of 10 Greeks who cast their vote for Golden Dawn were former New Democracy supporters. “When the main enemies of Golden Dawn are skeptical about the authorities’ intentions, there is little you can hope for from those who are ideologically closer to the party,” she says. Data suggest that in the 10 days following the clampdown, Golden Dawn saw its power drop by about 2 percent. Interestingly, the decline stopped as party leader Nikos Michaloliakos and two senior lawmakers were put behind bars pending trial on charges of participation in a criminal group. Their police protection was also pulled. On November 1, four days after Ochi Day, two Golden Dawn members, Manolis Kapelonis, 23, and Giorgos Fountoulis, 26, were gunned down at point-blank range underneath the Metaxas banner as they patrolled outside the party’s offices in the Athens suburb of Neo Iraklio, rekindling the party’s ratings. A previously unknown group, the Militant People’s Revolutionary Forces, claimed responsibility for the killings. In an 18-page proclamation, the organization said the attack had been carried out in retaliation for the stabbing of Fyssas. Police have not confirmed the authenticity of the claim. “The killings brought Golden Dawn into an ideal position. It was able to sell the argument that it is the victim of a conspiracy, as it has long insisted,” Georgiadou says. The martyr effect has been observed before, most memorably in the Netherlands. After Dutch right-wing populist Pim Fortuyn was shot dead in 2002, his party went on to win an unprecedented 17 percent of the vote in elections. Analysts agree that containing Golden Dawn’s momentum is a daunting task. Part of the challenge lies with the party’s structure and evolution pattern. Unlike mainstream political parties, Europe’s extremist groupings have mostly sought to expand their leverage using regional strongholds as springboards – a model seen at work in Antwerp, the base of Belgium’s far-right Vlaams Belang, and in Carinthia, the bastion of Austria’s Freedom Party. Extremists use these strongholds to carry out on-the-ground, grassroots work that allows them to directly engage with local community groups, often posing as guardians. 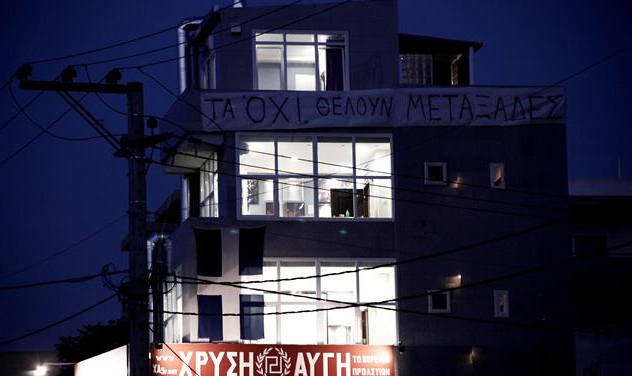 Golden Dawn picked Aghios Panteleimonas, a high-crime, low-income neighborhood in central Athens with a large immigrant population, as well as the poor shipbuilding district of Perama, outside Piraeus. For the past few years, Georgiadou and Lamprini Rori, a researcher on Golden Dawn and PhD candidate at the University of Paris (I), have studied how the party has used the neighborhoods as bastions to build a strong social network and at the same time bolster its visibility. It was in Perama, she says, that Golden Dawn succeeded in gradually becoming the main receptacle for unemployment-hit working-class voters who had formerly been taken under the wing of the Greek Communist Party (KKE) – a process reminiscent of “left LePenism” in France during the 1990s. “If you really want to curb the influence of Golden Dawn, you have to cripple its strongholds,” Georgiadou says. Can the influence of Golden Dawn be contained? If there is one thing analysts agree on, it is that any progress will take time. Greek lawmakers last month voted to strip a number of Golden Dawn deputies of their immunity to make way for a deeper investigation into allegations against them. Three of them faced magistrates on Monday to defend themselves on charges of belonging to a criminal organization – the same charges that have been brought against Michaloliakos and another five deputies. The three were given until December 7 to prepare their defense after asking for more time to look through the bulky case file. Any political message, Mandravelis says, will take longer to hit home with this section of society than others. “The deliberations in this lower level of support for Golden Dawn take time – this is not a group of people that contemplates politics or takes a long, hard look at things,” he says. Driving the message home will also depend on the ability of the political class to reconnect with a disaffected section of society used to selling their vote in exchange for party favors. “Mainstream politicians have lost touch with the working classes. In the good old days they were able to control them through patronage. They gave them jobs and had their vote in return,” Mandravelis says. Dinas is rather pessimistic about the chances of eliminating Golden Dawn’s influence. He says that the absence of rigid political ties to established parties, as a result of voters’ frustration with the brutal debt crisis and reduced opportunity for patronage, has worked to the benefit of the self-styled anti-establishment party. “It seems that we will have to learn to coexist with an anti-democratic wing in the Parliament which will probably continue to attract approximately one out of 12 voters,” Dinas says. Mandravelis remains optimistic that the power of the party will wane, sooner or later. “Whatever inflates quickly, usually deflates just as fast. But it will take a symbolic event for this to happen,” the commentator says. Although the party itself may eventually be eclipsed, the ideas that propelled it into being look like they are here to stay. “The values and ideas that Golden Dawn stands for – nationalism, racism and xenophobia – are not alien to Greece. They were not brought here by Golden Dawn; the truth is they already existed,” says Mandravelis. Its dark past has so far helped to spare Germany the rebirth of any influential anti-immigrant party, the likes of which have established themselves in nations with strong democratic credentials such as Netherlands, Sweden and Denmark. German Chancellor Angela Merkel, its defenders say, has been working hard to make sure things stay that way – but not without some controversy. Speaking to a gathering of young members of her Christian Democratic party in Potsdam last month, Merkel said that the country’s attempt to build a multicultural society had “utterly failed.” Merkel, known for her deft diplomatic approach, said that the idea that Germans and foreign workers could “live happily side by side” was an illusion. The chancellor’s remarks were widely interpreted as a shift to the right, bringing her more in tune with her party’s conservative wing, which has advocated a more hard-line approach on the Integrationsverweigerer, or integration-deniers. But some analysts beg to differ. “It seems to me that she is misunderstood in the English media,” Riem Spielhaus, an Islam expert at the Humboldt-Universitat zu Berlin, told Athens Plus. “Actually in German you can interpret her statement as a shift from an exclusive to an inclusive approach, while she would still spice this up with some demands from immigrants,” she said. The German model, however, can hardly be called multicultural. Germany invited millions of guest workers in the 1960s and 70s who were recruited almost exclusively in the country’s industrial sector. Most of them returned to their home countries but millions of others stayed. About 4 million Muslims live in Germany, a nation of 82 million. Most of them are of Turkish heritage. “There was a lot of encouragement to go back until the late 1990s, but very little encouragement to integrate into German society in order to stay. And I think this is what Merkel was referring to with her statement,” Spielhaus said. “This has been the German model to ‘muddle through’ – if one can speak of one at all. That means there never has been a state policy accepting multicultural life,” she said. At the same time, many immigrants have been reluctant to expose their offspring to the culture and values of the host country. Many refuse to even learn the language. Merkel has from the beginning of her first term in government tried to change this by supporting the integration of immigrants and their offspring. Speaking ahead of a national integration summit this weekend, she said that more immigrants should work for the state in Germany. His comments were no match for the controversy caused by former central banker Thilo Sarrazin. In his book “Deutschland schafft sich ab” (Germany does away with itself) published late in the summer, Sarrazin, a social democrat, said Muslim immigrants were dumbing down German society because they are less educated but have more children than ethnic Germans. Sarrazin was fired from the Bundesbank but his book is flying off the shelves in Germany. Analysts agree that economic insecurity and an influx of foreign migrants, both exasperated by globalization, have fueled popular anger at established political elites across the continent. Xenophobic populist parties have sought to capitalize on the trend – only this time they are not using the argument of race, but rather hijacking Enlightenment talk about freedom. The party of Geert Wilders in The Netherlands – which recently signed up to a minority center-right coalition in return for a government pledge to introduce a ban on the burqa and stricter immigration controls – claims to be defending Western values of freedom and democracy against Islam. “There is only one value right-wing parties have not borrowed from the Enlightenment, so to speak, and that is universalism,” Sjoerd de Jong, editor at the NRC Handelsblad newspaper, told Athens Plus. “Sure, they promote Western culture, but many times it’s just a universalized form of particularism: our culture as we know it,” said De Jong, author of “Een wereld van verschil” (A World of Difference) an analysis of Holland’s well-tested multiculturalism. Wilders is currently on trial for inciting hatred against Muslims after remarks in which he compared Islam to fascism. But the procedure has not exactly caused him harm. “Wilders’s prosecution for hate-speech has only increased his popularity, as an angry outsider attacking a corrupt and ‘politically correct’ establishment,” De Jong said. Pim Fortuyn, the slain anti-immigrant party leader, was one of the first to address these issues in a populist way, but he still veered to the left on cultural issues. Wilders, who has always been closer to the conservative movement in the United States, has taken the culture war to the next level: an all-out attack on Leftism. “His approach is altogether more harshly ideological than Fortuyn’s was. And while Fortuyn always kept a sense of humor, Wilders is just angry,” De Jong said. Voter frustration over lackluster centrist parties has boosted right-wing parties in Austria where the xenophobic Freedom Party made a strong showing in recent provincial elections in Vienna, traditionally a center-left stronghold. In Sweden, a xenophobic anti-immigrant party that calls itself the Sweden Democrats has entered parliament for the first time, while in Denmark, the government depends on support from the nationalist Danish People’s Party. Analysts are divided on whether letting populist parties join the government – provided they have enough votes – is the best way to moderate their message and influence. A decision to include the Freedom Party, then under Jorg Haider, in the government 10 years ago led to Austria’s diplomatic isolation by the European Union, but it was seen as key in sapping it of its power, as some within the party chose to water down their language to succeed in government. Kasper Moller Hansen, a political scientist at the University of Copenhagen, believes the carrot has worked in Denmark as the country’s populist party has largely moved away from the extreme views of 15 years ago. “They want to be part of the government, so they try to moderate their claims. They still are a party that wants to limit the number of immigrants, but in order to be part of the government they have to be more pragmatic on these issues,” Hansen told Athens Plus. But De Jong has doubts whether that would do the trick in Holland. “Wilders is much too smart a politician to fall into this trap,” he said. “He has built his organization – remember, it’s not a party, but a movement, without members or party structure – as an opposition movement. He will never want to join a government at this stage of its development, still building and hunting for resources and talent,” he said. Europe’s existentialist debate is set to heat up as countries try to come to terms not so much with the influx of migrants, but more so with the growth in migrant-origin families as the second and third generations emerge. It was 1995 when Juul Bovenberg’s father became seriously ill. After a short but painful spell on his sickbed, Mr Bovenberg asked his GP to take away his suffering by taking away his life. The family and the doctor agreed to the man’s final wish to choose a dignified death over endless, unavoidable pain. When the GP visited the house to carry out the euthanasia, for once Bovenberg’s attention was not focused on her ill father. In fact, the 23-year-old Juul could not help stare at the man who had come to end her father’s life. “I noticed how nervous he was. His whole body was shivering, and I saw his relief after he was done. As his car left the driveway, I realized how difficult this must have been for him. He was the one to actually pull the trigger. I asked myself: How will he return home; what does he feel right now?” she explains now. But it would be years before Bovenberg, a Dutch filmmaker in her late 30s, would begin to search for an answer. In 2009, she made a documentary inspired by that incident. “A Deadly Dilemma: Euthanasia from a Doctor’s Perspective” – which was screened last week at the 2nd International Health Film Festival on Kos – follows three Dutch GPs during each of their preparations for and the sequel to performing euthanasia on one of their patients. The movie, which won the jury’s second prize for medium-length films, came after last year’s screening of John Zaritsky’s “The Suicide Tourist,” a compelling documentary about an American Amyotrophic lateral sclerosis (ALS) patient’s decision to make use of assisted suicide in a Swiss clinic. 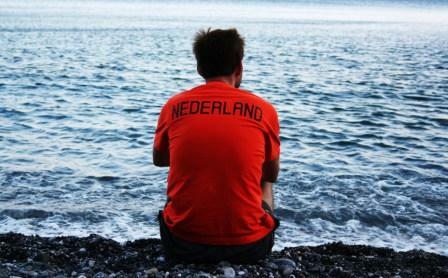 Voluntary euthanasia has been legal in the Netherlands since 2002. Doctors are allowed to help terminally ill patients to die, provided they follow a set of strict regulations designed to prevent abuse. Patients must be terminally ill adults facing a future of “unbearable” suffering. They must have made a voluntary, considered and persistent request to die, while a second, independent physician must give the green light before the procedure is carried out. Holland was one of the first countries to legalize mercy killing, although the practice had been unofficially tolerated for decades. Voluntary euthanasia and/or assisted suicide, which has also been legalized in Belgium, Luxemburg, Switzerland and the US states of Oregon and Washington, is still very much the subject of controversy involving moral, medical, religious and philosophical questions. Notwithstanding the title of Bovenberg’s documentary, the doctors featuring in it seem to have no second thoughts about the ethics of the practice. What they do seem to carry is the mammoth emotional burden about being the ones to shut down the circuit. “You are not trained to kill someone,” one of them says in the movie. An ethical decision is not necessarily an easy decision. In the movie, we see the doctors holding their regular meetings with their terminally ill patients, discussing with them and their relatives as they regress. The process is emotionally difficult and, in some cases, practically almost impossible. A heavily paralyzed woman suffering from ALS struggles to communicate with the doctor by moving her thumb and, when this becomes impossible, with slight nods of her head. Her husband sits alone in the backyard. The doctor is worried that her rapidly deteriorating patient will soon no longer be able to give her (legally required) consent. In the end, she doesn’t have to, as the woman dies of natural causes. Bovenberg, who lives on a houseboat in Amsterdam, studied documentary and production at the Dutch Film and Television Academy (NFTVA) in Amsterdam. She is the winner of the prestigious Nipkowschijf award for the VPRO Dutch television series “Veldpost.” Her “Looking for Loedertje” was nominated for the Dutch Academy Award while “Laura is my Father” was nominated at the Cinekid Festival. “A Deadly Dilemma” is her twelfth movie. “Why do you do it?” the director asks the third doctor, who is preparing to end the life of a young woman who has cancer. “In the end, because of my love for my patients,” he replies. Jessica Villerius knows a thing or two about control. Having struggled with anorexia nervosa for about 10 years, the 29-year-old filmmaker from the Netherlands will tell you that the concept is central to understanding the demonic workings of this eating disorder. Starving yourself to death, she says, can give you a sense of control when other parts of your life are going wrong or simply seem too hard to deal with. Anorexia has the highest mortality rate of any mental illness. Only about 40 percent fully recover. Jessica is one of those – and she has taken her victory a step further, by making a documentary that aims to inform people about this lethal disease, while exposing the “war in the head” of the patients. Her powerful 60-minute film “Facing Anorexia” (Vel over Probleem), which went as far as to prompt a change in Dutch state clinics’ treatment of the condition, is showing at the 2nd Ippokratis International Health Film Festival on Kos, at the Orpheas Municipal Theater, on Friday September 3, at 9 p.m. For more information, visit http://www.healthfilmfestival.gr. What made you shoot this documentary? I wanted to show the world the truth about this “sniper”-disease. It infiltrates your body at first (the urge to be thin) but becomes part of your mind in the end. It is so dangerous, because at that point it’s really difficult to get yourself together and recover. Your state of mind — after a long period of not eating and torturing your body — is so unhealthy, that you really need help from outside to recover. I wanted to show that this is indeed a deadly disease, and also very importantly, that it’s not a matter of choice. You simply don’t choose to have anorexia. It’s awful and torturing — something you would not wish for your worst enemy. I have read that you are a former anorexia patient. Did making this documentary involve facing up to past demons or did the experience actually help you in making the movie? Yes, I did a lot of catching up with old demons, something that I wasn’t really prepared for. I thought I had buried my grief. But watching the girls — I always call them “my” girls — suffer and struggle really opened up some old wounds. But in the end it was all worth it. What are the main myths and misconceptions surrounding this disease? Three things: that it is a choice, that it is about eating and that it is impossible to fully recover. All not true. Are you in favor of legal measures such as banning too-skinny models from the catwalks, censoring photoshopped ads and closing down pro-anorexia websites? No. I’m not one of those people who think that you can get ill by looking at pictures. Of course, young girls should be taught that they are beautiful just as they are, but let’s stay real: We also have to watch our kids not getting overweight. There is a middle ground. Closing down pro-ana sites is not the answer: Those kids will find each other anyway. An answer to that could be more information about the danger. Sounds corny but by shutting down those sites we do not solve the problem. You cannot get anorexia by just looking at the sites, you can get more in trouble by watching them. We should monitor these girls and offer them the right professional help. Can media stereotypes actually incite anorexia or do they simply reflect and encourage an existing cause or trend? I think they only reflect and encourage. Anorexia nervosa is a disease that is – partly — determined by genes. A number of experts and former anorexia patients say that underneath the well-recorded psychological, biological and environmental reasons behind the disease, most of the causes can be traced to issues of control: Adolescent girls with poor self-esteem relish the sense of control that dieting gives them and refuse to stop. What is your opinion? Totally true. It’s not about eating, calories or being thin. It is all about control. The only thing we have control over and is visible for the outside world, so that they can see your statement, is your weight and appearance. That’s it. It’s a way to show yourself and others that you are extremely unpleased with yourself or a situation. Is there a turning point when anorexia sufferers actually realize that their psychological condition has become a physical one? It’s the other way around. The first notable change is physical. The second is psychological. And that one is much more difficult to solve. But you have to worry about the first one first. Because if your body is not cooperating, your mind will eventually also let you down. And then… you loose. You need to get your mind straight in order to recover. When someone with anorexia decides not to die from this disease, she will recover. Most anorexics are extremely wilful and strong. How easy was it for you to communicate with the patients interviewed in your film, given that they refuse to accept they have a problem? Very easy. We speak the same language and it was simply impossible for them to lie to me – which is what they did to their parents and doctors. Did the girls featuring in the documentary actually watch the film? How did they respond to it? Yes, of course. I went up to them personally to watch it. It was very difficult for them, as they cannot look at their own bodies, let alone on screen. That’s why I have tremendous respect for these girls. They put their own sorrow aside to help others and that’s why I truly love them. What has the overall response to your film been so far? Are you working on a new project? It was amazing. It was in all newspapers, magazines and television shows in the Netherlands. It has been sold to eight countries now because it shows a pure look on anorexia. Our health system has been adjusted after the film. This time, it came painfully late. Andres Iniesta’s volley in the 116th minute of the World Cup final made sure the Dutch returned home from Johannesburg empty-handed. Fans of Holland’s total football and its later-day reincarnation were dismayed at van Marwijk’s Calvinist-style rejection of unnecessary beauty for the sake of defensive pragmatism. The typically outspoken Johan Cruyff – the most famous exponent of Holland’s “totaalvoetbal” in the 1960s and 70s and, interestingly, the man who exported the trend from Amsterdam’s Ajax to Barcelona – also complained that Holland had lost its soul. “I thought that my country would never renounce their style,” he grumbled after an artless, and at times brutal, final on Sunday which saw the Netherlands collect a record nine yellow cards before being reduced to 10 men. “I was wrong. Of course I’m not hanging all 11 of them by the same rope – but almost. They didn’t want the ball,” the Dutch football icon said. The truth is that sharp playmaker Wesley Sneijder, dashing winger Arjen Robben and (Holland’s biggest disappointment in this Word Cup) quicksilver striker Robin van Persie are the only players in the team that can make your heart beat faster. The three, none of whom play in the Dutch league, are stylistically miles away from the two midfield destroyers Mark van Bommel and Nigel de Jong, hailed by many commentators as the true heart of this squad. De Jong’s karate kick into the chest of Xabi Alonso, one of the haunting images of this final, was emblematic of the cynical, unusually head-shaved Nederland. Still, you can hardly blame the coach for wanting to break with a past of beautiful tragedy. As Mike de Vries wrote in Guardian’s sport blog: “Success in itself is a kind of beauty and it is a beauty the Dutch as a World Cup nation has never experienced.” Although playing by far the fanciest football, Dutch teams always seemed to collapse in their most crucial games, as if they came with some sort of self-destruct button – most painfully, in the 1974 World Cup final defeat to Germany. “There is a deep unsolved trauma around this 1974-defeat. Like an unpunished crime,” a Dutch psychoanalyst tells David Winner, a British observer of Holland’s football tradition, in “Brilliant Orange: The Neurotic Genius of Dutch Football,” a captivating analysis of the “Dutch syndrome,” defined as a peculiar mixture of football ingenuity and chronic underachievement. It’s enough to say that in terms of trophies, Holland, widely regarded as the best team not to have won the World Cup, ranks next to Greece, each having won a single European Championship title. Whatever the causes, the Dutch decided it was time for some ugly wins. They arrived in South Africa having scored eight straight victories in the qualifying rounds and then went on to win all six games up to the final. Performances were mostly solid but far from breathtaking. If there is one player that aptly summed up the character of the team, that would be Liverpool’s wide midfielder Dirk Kuyt: industrious, combative, banal. In the end, the betrayal of the artistic legacy bequeathed by the football generations of Cruyff, Marco van Basten and Dennis Bergkamp for the sake of a safety-first attitude was not enough to fend off the curse of the two lost finals in 1974 and 1978 – nor the psychic powers of Paul the octopus. “This ugly, vulgar, hard, hermetic, hardly eye-catching, hardly football style, yes it served the Dutch to unsettle Spain. If with this they got satisfaction, fine, but they ended up losing. They were playing anti-football,” Cruyff said. As Iniesta struck his shot past goalie Maarten Stekelenburg deep into extra time, the fluorescent orange crowds must have experienced a strong sense of deja vu. Only this time, losing did not seem to hurt as much – perhaps the only good thing about losing ugly.